KozNote is a new finance iPhone app developed by Crowd Cast. 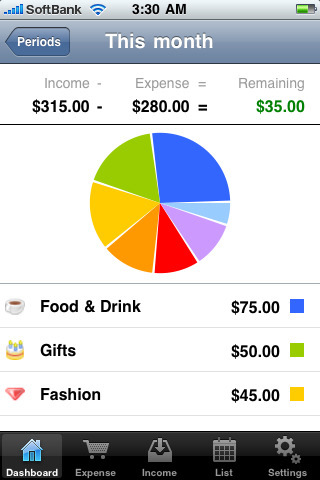 This app allows you to track your spending, income, and expenses on your iPhone. KozNote is unique because it helps you save money and stick to your budget by actually showing you your spending habits on a pie chart. You start out by choosing a period in which to record your payments or income in, this can be from day-to-day, 30 days, or you can customize the period yourself. After you’ve chosen the time frame in which you want to record your finances in, start recording. At the bottom of the screen are expenses and income. Within each expense are categories, how the expense was paid, the date, and any notes you want to attach to the payment. The income section is similar; type in the amount, date, notes, the subject, and how you received the income. There is also a listing category for you to view all of your entries. The dashboard allows you to actually see the proportions of income and expense, and shows you your remaining amount. If the categories in the expenses don’t really fit your lifestyle, go to settings and customize them. For example, there wasn’t a “rent” category, so I made one. You can add or delete any other criteria in the expenses or income sections. Also in settings is an option for a passcode lock. If you’d like some security, just create a passcode, you’ll have to type it in each time you open the app. The first time I used this app, there were already amounts recorded, so I had to go through the previous amounts and delete them all so I could start recording with a clean slate. I’m not sure why the developers did this, maybe so I could see what the app looks like filled with entries? The best part of this app is the pie chart; being able to see your spending can bring your attention to any bad habits you may have. Just a warning, seeing your rent payment eat up such a big portion of the pie may cause you to spend the next few hours on Craigslist looking up apartments in the less-costly areas outside of Los Angeles. AppSafari review of Expense Tracking (KozNote) was written by Amanda McFarland on May 21st, 2010 and categorized under App Store, Finance, Notes, Productivity, Reference. Page viewed 4090 times, 3 so far today. Need help on using these apps? Please read the Help Page.